Item 020 - Water Scene, Lake Nipissing at Callender (sic) 3687. 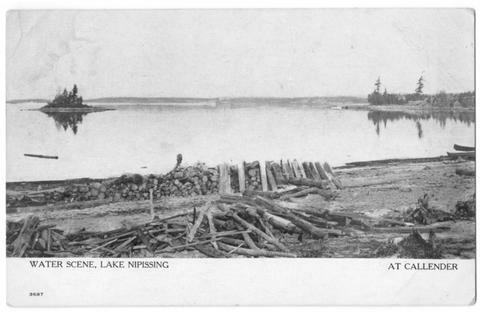 Water Scene, Lake Nipissing at Callender (sic) 3687. Postcard cancelled at Callander, date not legible. Addressed to: Miss Sarah Stail. Lynedoeh. Ontario. Norfolk Co. Message reads: Callander Sept 2/ 18. Dear Sarah. I am sorry I have kept you waiting so long for a answer to your letter but this will explain. Since the middle of June I have been on my hollidays & was with friends on Manitoulin Island for several weeks. Your letter was sent there from Toronto. I have been here in Callander for nearly a month and do not know just when I will go back to Toronto. Have had a grand time in this northern country this summer. Am getting awfully fat. Sarah write to me here will you. Just Callander Ont. Then I will answer your kind letter. Love to every body. How are they all & Cassic? Hope to hear from you soon. Love from Winnifred A.